In Italy many recipes have a “rosso” version (with tomatoes) and a “bianco” version (without tomatoes). For instance, a “pizza bianca” means a pizza without tomatoes. This also goes for pasta sauces, amatriciana is usually rossa, but amatriciana bianca also exists (which is also called alla gricia). 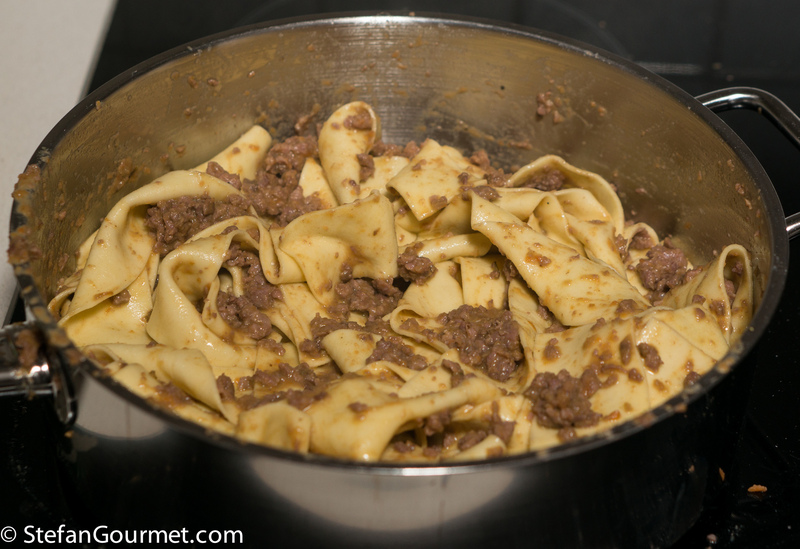 A famous recipe from Tuscany and Umbria is papparadelle al ragù di cinghiale: fresh wide pasta ribbons with a wild boar and tomato sauce. There is also a version without tomatoes, and that is what this post is about. This white version tastes more meaty and more gamey than the red one. 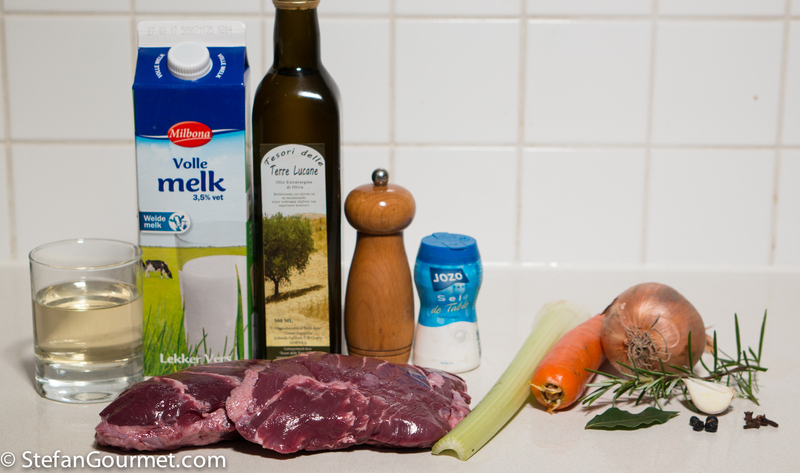 As a further twist, I’ve cooked the meat sous-vide, but I have included instructions how you could cook it traditionally on the stovetop if you prefer. The benefit of sous-vide is that the meat in the sauce is super tender and juicy rather than a bit dry, as it can be in a traditionally cooked sauce. 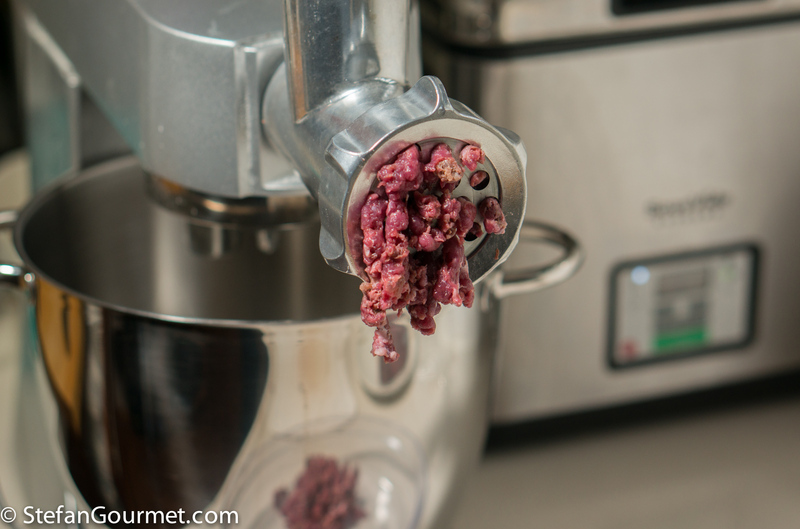 Browning the meat produces flavor, but grinding the meat first and then browning it will make it dry and can make it even have un unpleasant brittle texture in the sauce. 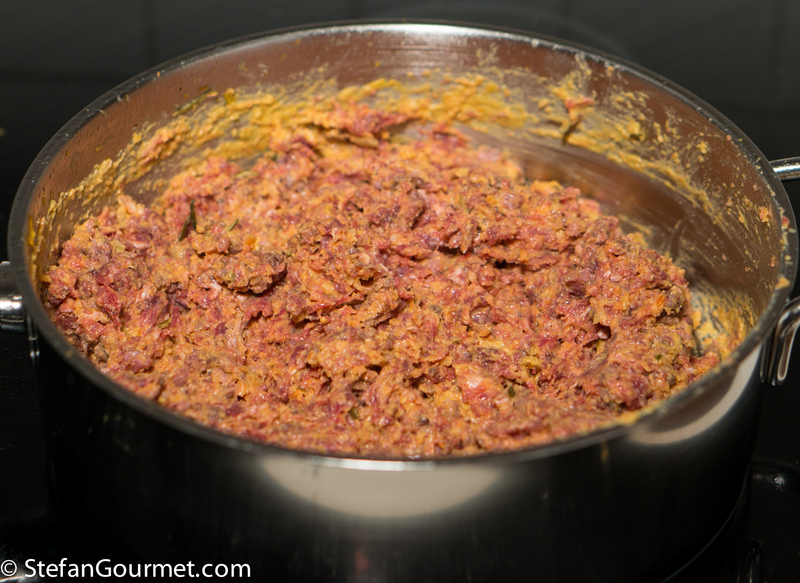 So as a comprise, I browned the boar cheeks only on the outside before grinding it. Season the boar meat on all sides with salt and freshly ground black pepper, and brown it on all sides in 4 tablespoons of olive oil over medium-high heat. 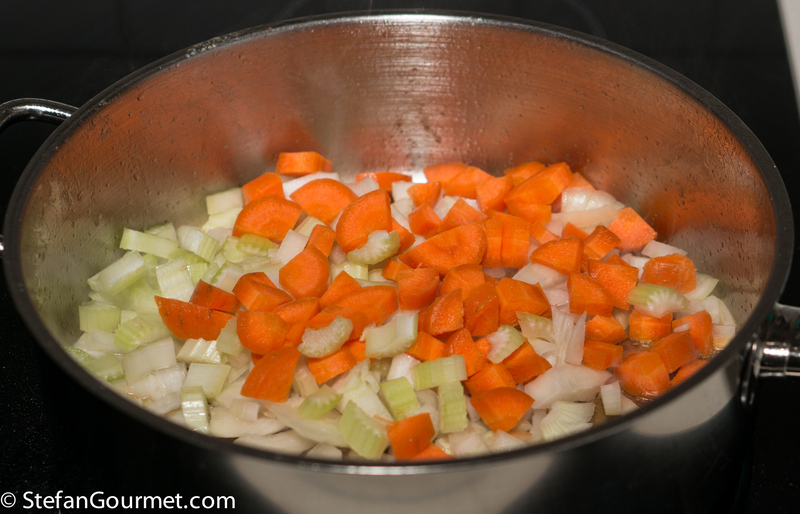 Seasoning before browning will help to develop a more flavorful crust. 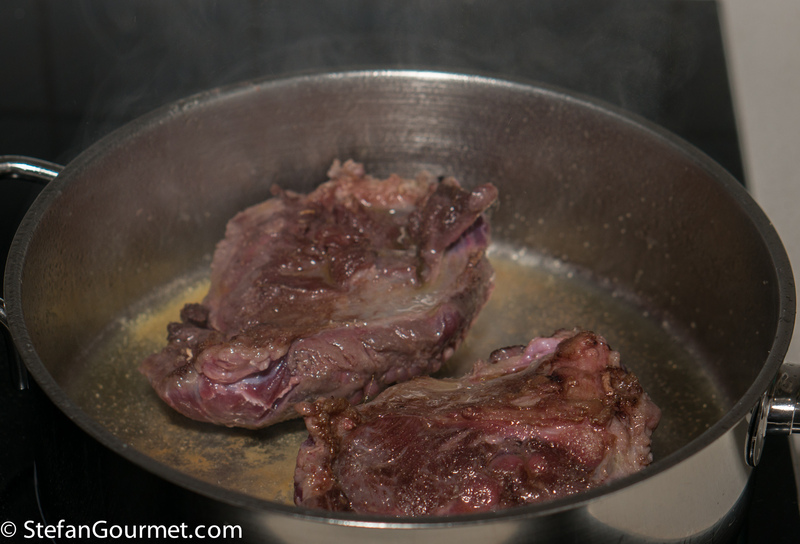 When the meat is nicely browned on all sides, take it out of the pan and set aside on a plate. 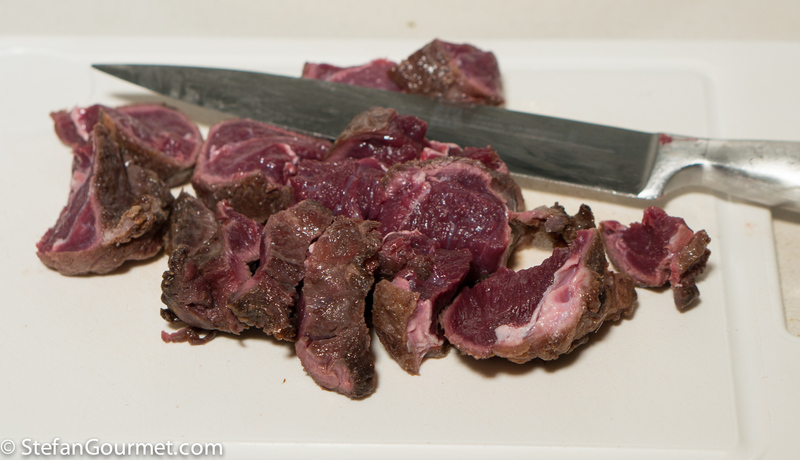 Once the meat has cooled to room temperature, cover with plastic wrap and refrigerate. There will be a lot of flavor left in the pan. 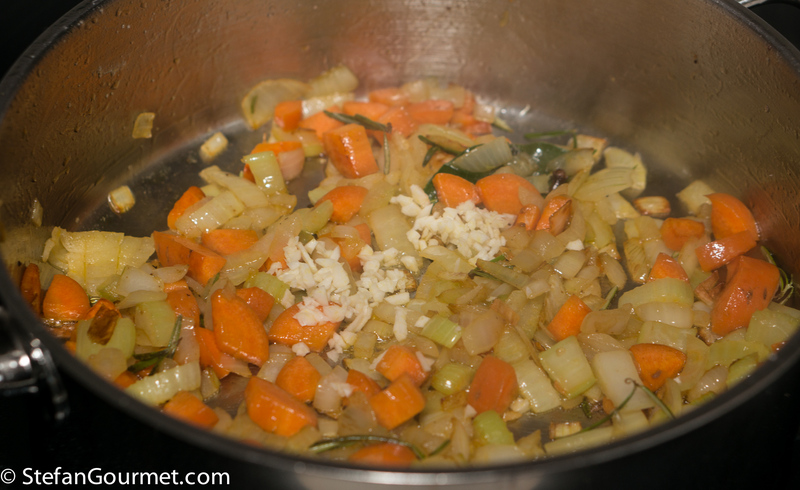 …and stir over medium heat until the vegetables start to soften. 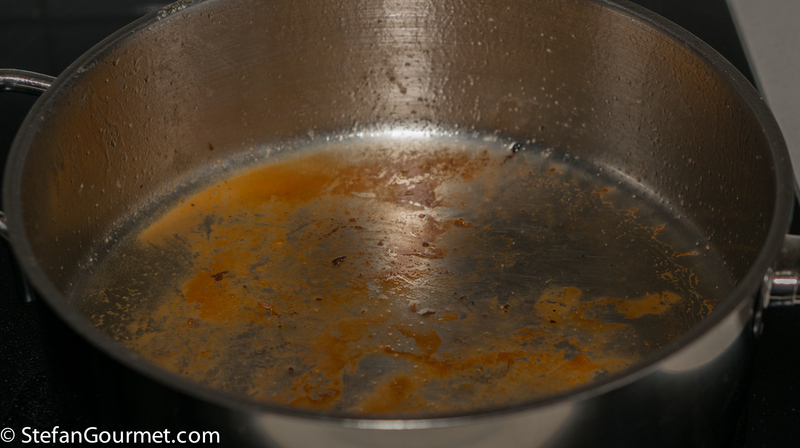 Make sure to scrape the bottom of the pan with a wooden spatula to get all the flavor in there. 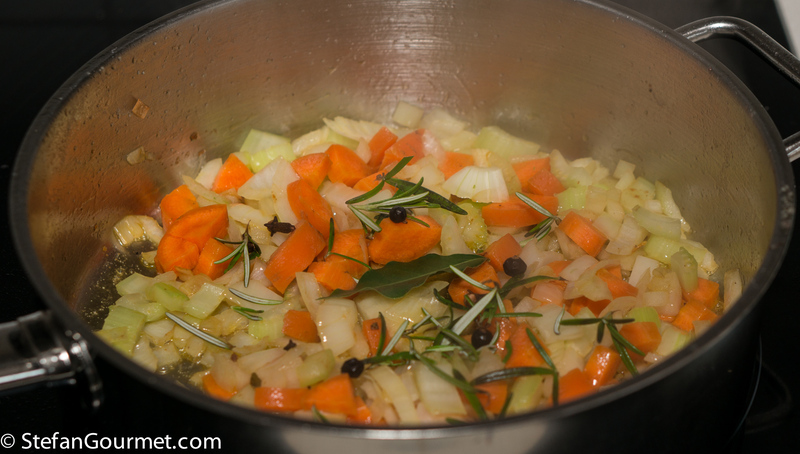 Add rosemary, bay leaf, juniper berries, and cloves, and stir for a minute. Add a minced clove of garlic and stir for another minute, making sure not to allow the garlic to brown as that would produce a bitter flavor. 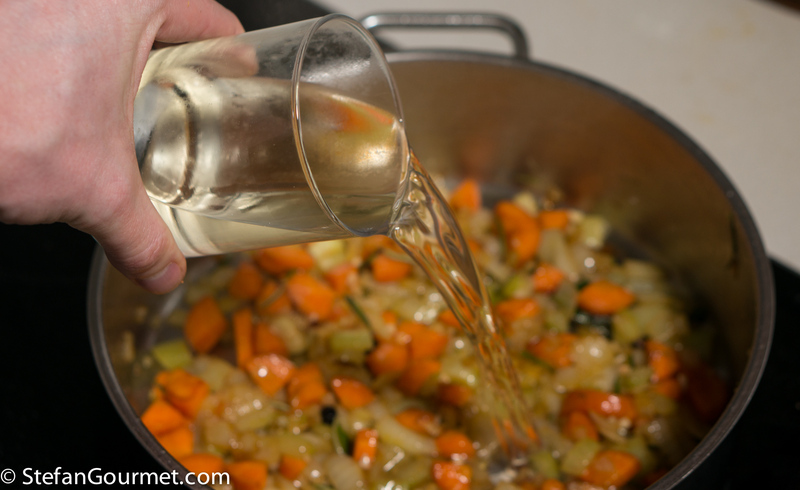 Now deglaze with white wine. Bring the wine to a boil and reduce by half. 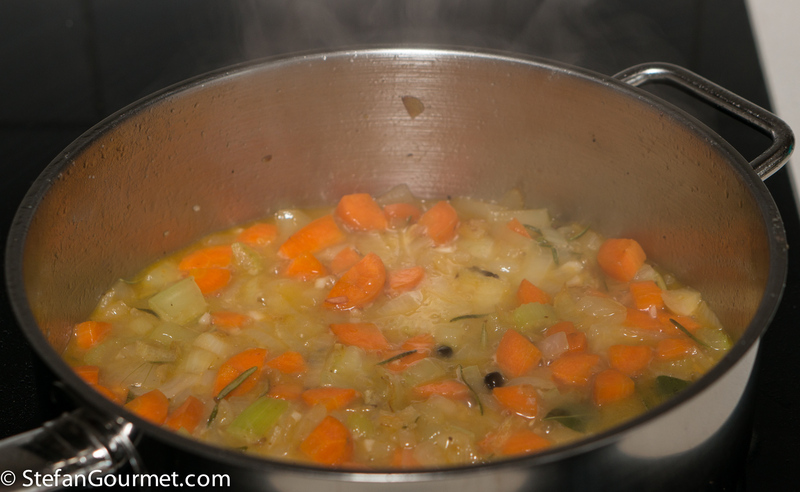 Bring to a boil and simmer over low heat until reduced by half. 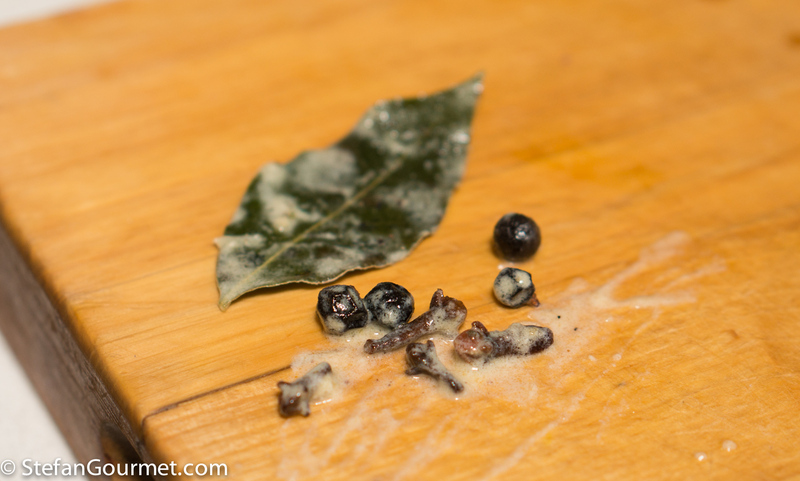 Remove the bay leaf, juniper berries, and cloves (it helps to count them when you put them in). If you are going to cook the sauce sous-vide and will be using a chamber vacuum sealer, allow the sauce to cool to room temperature. Take the meat out of the refrigerator. 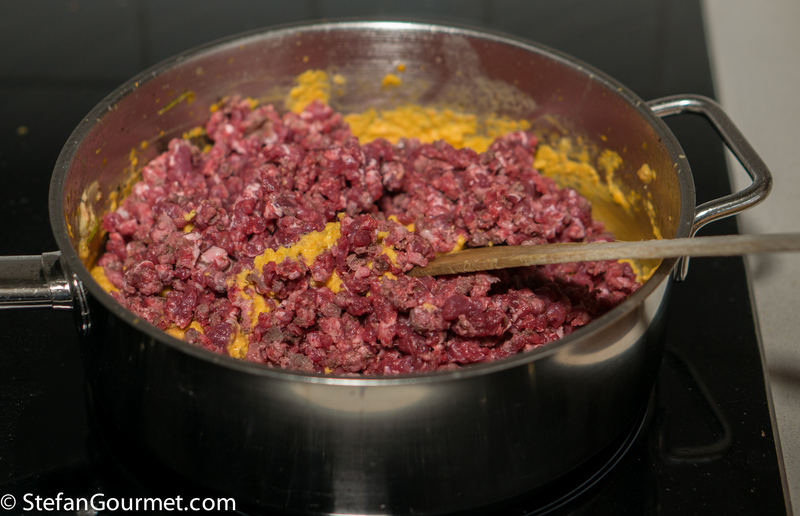 Cut it into suitable pieces for the meat grinder. 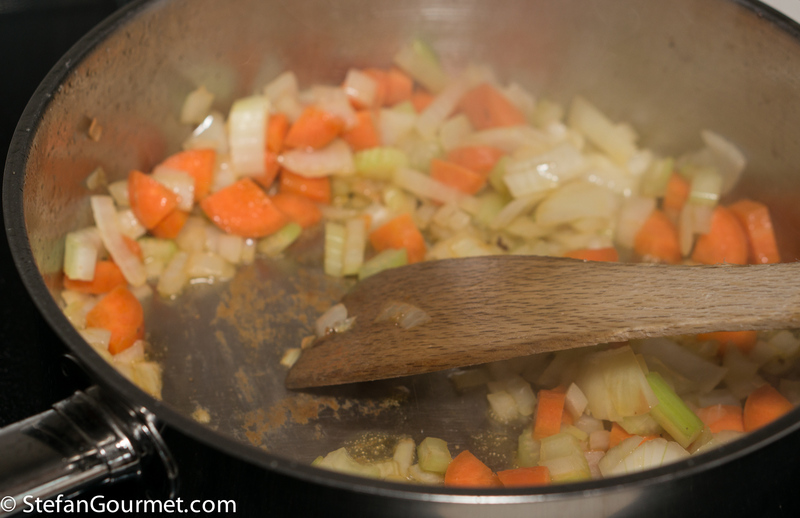 …and stir to mix. 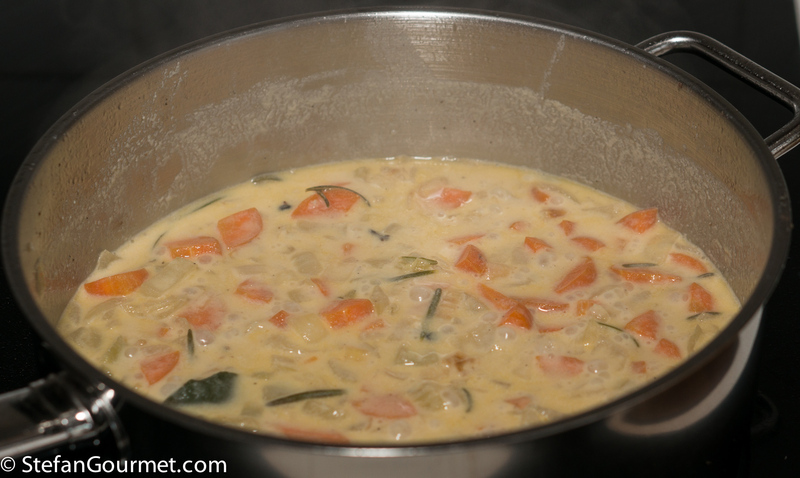 Now for a traditional stovetop preparation, cover and cook this mixture over very low heat until the meat is tender, adding water or stock as necessary if the sauce dries out too much, about 3 hours. 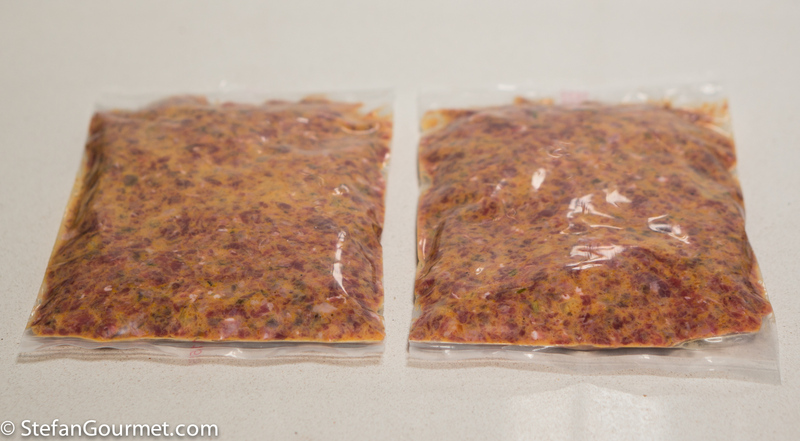 To cook the meat sous-vide, vacuum seal the meat and sauce mixture in a chamber vacuum sealer or by using ziploc bags and the water displacement method. 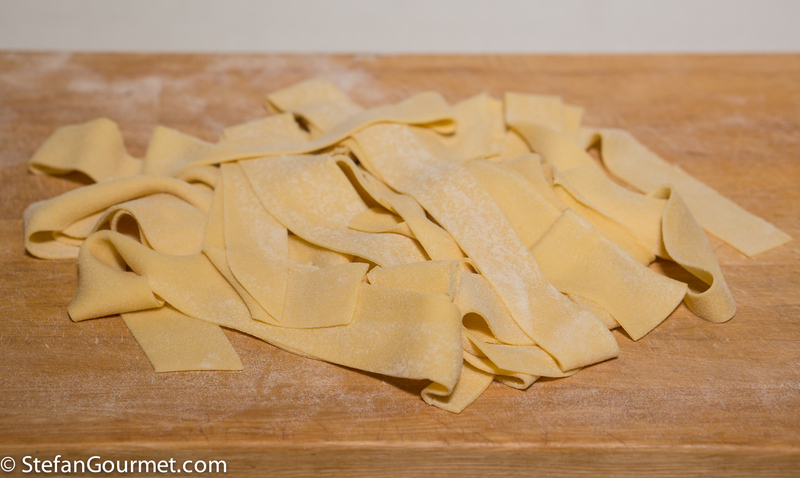 Make pappardelle by making fresh pasta dough, rolling it out (not too thinly), and cutting ribbons of about 2 or 3 cm (1 inch) wide. 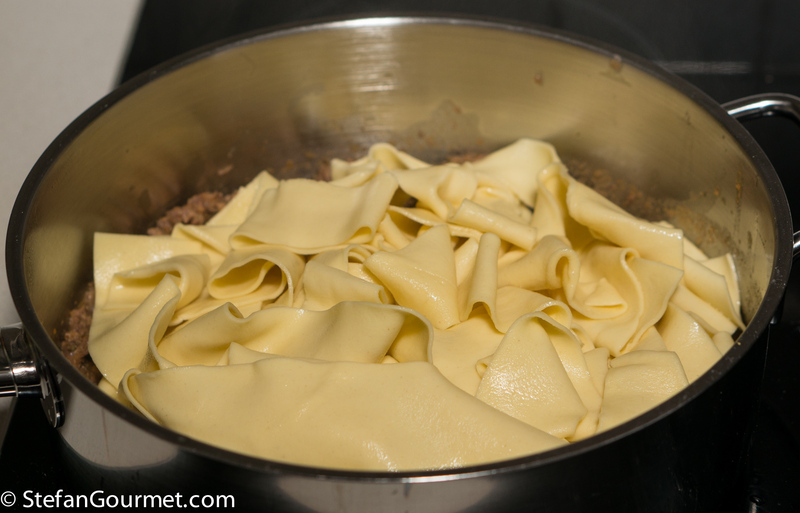 Cook the pappardelle in salted boiling water until al dente, then drain. 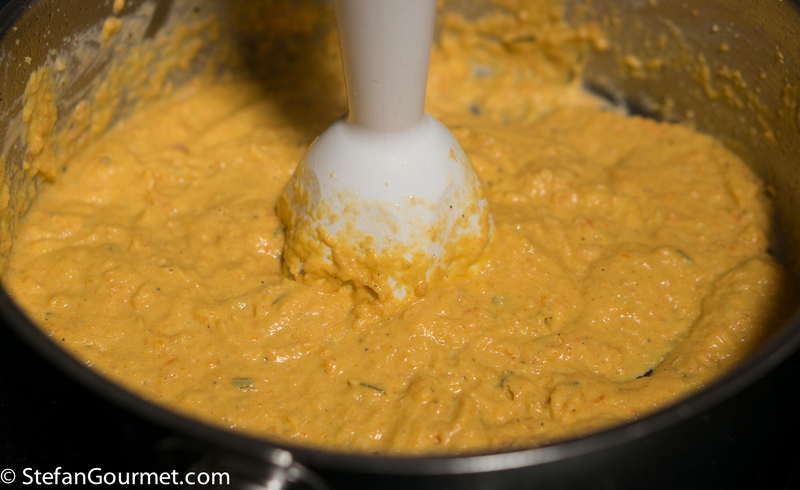 If you cooked the sauce sous-vide, empty the bag into a frying pan. 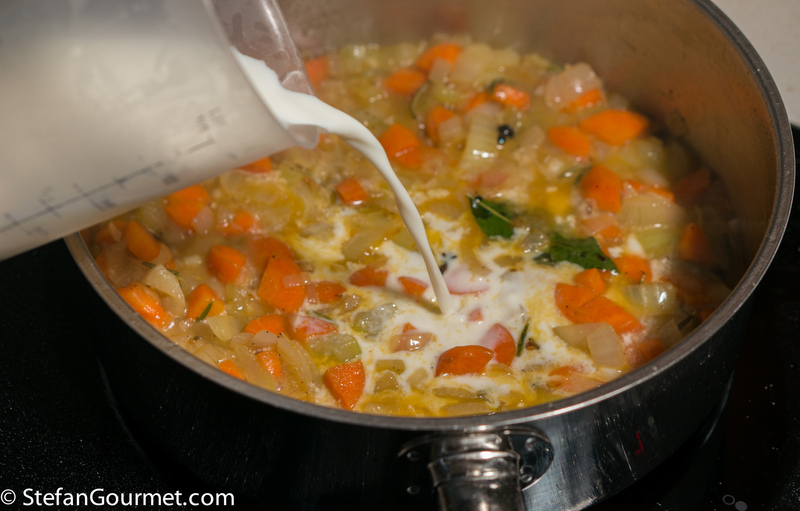 Bring to a boil, then immediately turn off the heat. 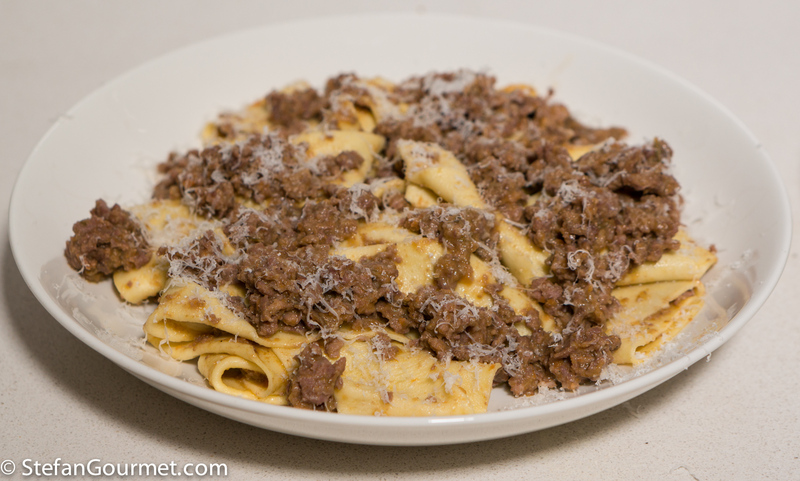 Serve the pappardelle al ragù bianco on preheated plates, and sprinkle with parmigiano if desired. 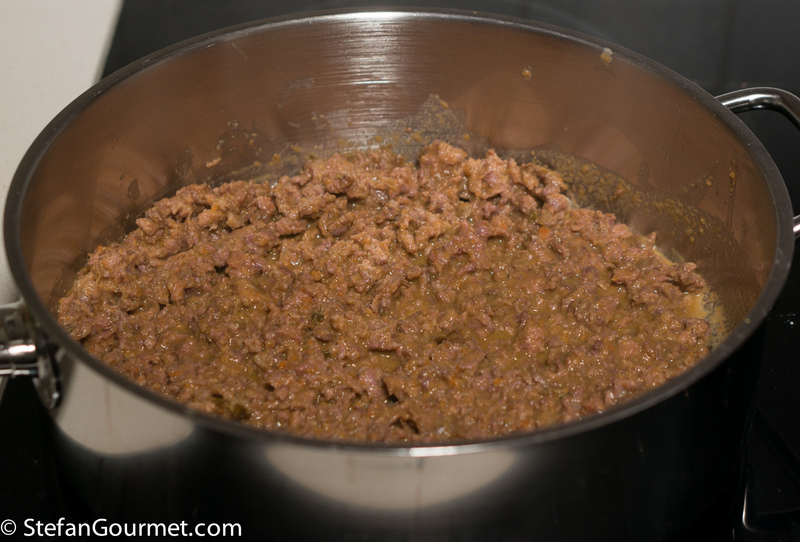 This meaty sauce can handle a nice red wine from the region, like a Chianti Classico. This gratin is a wonderful Italian way to serve (white) fish. 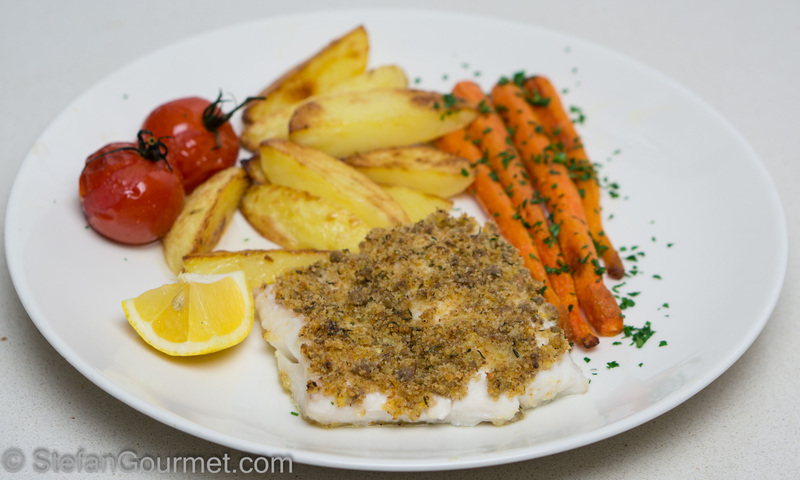 The fish is baked in the oven with a flavorful crunchy topping. What a nice rustic meal. I can imagine hunters of yore eating this dish..
Line 2. I think you mean “a pizza rosso is with tomatoes, not without”. I had meant to write “pizza bianca”. It has now been fixed. Thanks for pointing this out, I appreciate it. I didn’t know there is an Amatriciana Bianca. I have the red sauce version on my blog. I like the pappardella pasta. Btw, I think there is a typo in your first paragraph “wild board” just in case you wanted to know. I appreciate corrections on my blog. Another lesson learnt 🙂 ! Thought wild boar belonged to your hemisphere, talked to Mr Google and now know there are more wild boars than people in Australia! Now to find some to buy and try!!! Would love the somewhat gamey flavour methinks . . .
Look near the dog food section — that’s where I found kangaroo at Woolie’s! 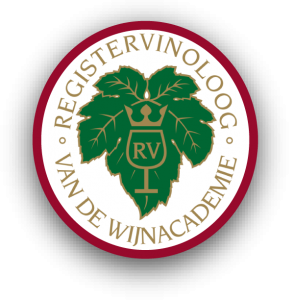 Ci sono i cinghiali in Olanda? Sì! Ma non sono così frequente sul menù come in Italia. Funnily enough, Stefan, it’s actually quite hard to buy cinghiale from butchers in the Rome area – go figure! Always easy to find on menus in Tuscany. 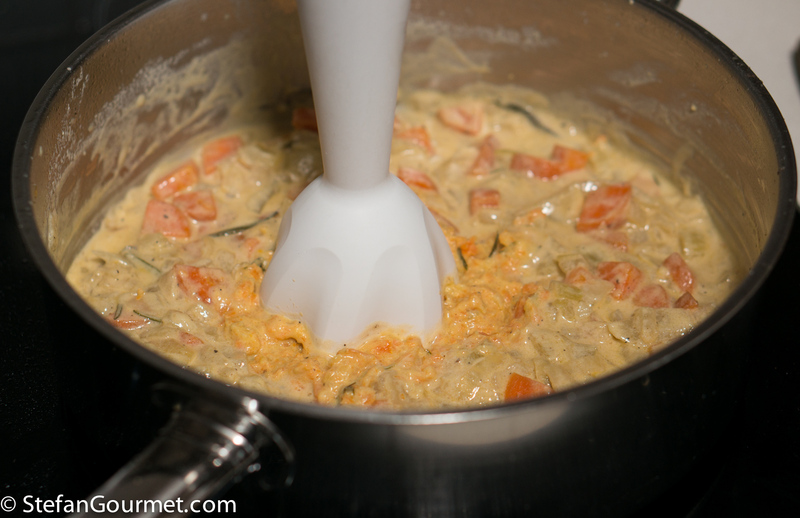 I think that making any pasta sauce without tomatoes calls for more skills in the kitchen. Well done! Thanks, Jo. Here regular butchers don’t have it, or only for Christmas.